Cedar shakes and shingles could give your home just the look you are looking for. Cedar roofing can be a stunning choice for your home. Cedar has a gorgeous and natural range of shades that includes reds, golds, browns, and ambers. 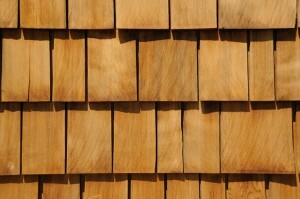 Cedar shakes and shingles offer you many practical benefits beyond aesthetics as well! Mulling over cedar shakes and shingles? Here are some of the benefits of choosing this type of wood for your roofing project. Cedar has natural insulating properties. As a result, it works hard to keep your home cooler in the summer and warmer in the winter, without touching the thermostat. Cedar roofing can definitely lower your heating and air conditioning bills all year long. Cedar is known to be one of the toughest and most durable woods in existence, and it doesn’t lose any of that durability when it’s cut into shingles. Investing in cedar roofing is a great way to ensure that your roof is structurally sound and strong for its entire lifetime. Aside from being tough and durable, cedar roofing lasts well throughout the seasons and all of the changes in humidity and weather that they bring. Even in areas of high humidity, like Maryland, cedar roofing can maintain its original size and dimensions without major expansion or shrinking. Cedar roofing also does at exceptional job at lying flat, remaining straight, and holding fastenings well and snugly. Cedar roofing is full of natural preservatives that help the material remain resistant to ultraviolet rays, insect infestation or damage, and moisture. Cedar also is naturally wind resistant, which is great for areas that have frequent summer downpours or gusty winter storms. Cedar is resistant to moss growth issues that can plague other types of roofing. Beyond its natural advantages, cedar roofing can be specially treated to resist fire, fungus, and pests. If you are ready to get the perfect cedar shakes and shingles for your Leesburg home, you can trust Absolute Home Solutions. We are a family owned business with top-notch customer service. We will never cut corners and we will work tirelessly to make sure that you love your home. Contact us online or give us a call at 240-328-9872 for more information and a consultation. We serve many areas throughout Montgomery County, Anne Arundel County, Howard County, Baltimore County, Washington, D.C., and Virginia. To see examples of our work and get exclusive specials, follow us on Facebook, Google+, Pinterest, Twitter, YouTube, and Houzz. This entry was posted on Friday, July 29th, 2016	at 3:05 pm	and is filed under Roofing . You can follow any responses to this entry through the RSS 2.0 feed. You can leave a response, or trackback from your own site.